The Graphic Art Collection comprises European prints from the 15th century to contemporary, drawings, watercolours and photographs. Highlights include the George Powell of Nanteos Bequest of pictures, bronzes and objet d'art (including works on paper by Turner, Burne-Jones, Rossetti, Poynter, Rebecca and Simeon Solomon). There are 5,000 wood engravings for periodicals of the 1860s and a fine prints representing the Etching Revival since Whistler; particularly etchings of the inter-war years, with works by Sutherland, Hoyton, Griggs, Webb, and Brockhurst. There is also fine representation of art in Wales since 1945 and of contemporary printmaking, contemporary Welsh photography, and an outstanding collection of post-war Italian photographs. In the galleries are displayed changing exhibitions from the collection, touring shows and exhibitions by invited artists. All collections are available for study by appointment. 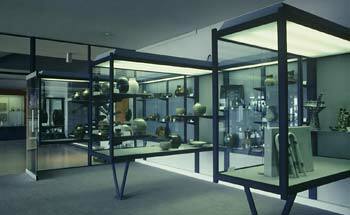 The Ceramics Collection is housed in a purpose-built gallery in Aberystwyth Arts Centre on the University campus. It comprises contemporary British, European, American, and Japanese studio pottery, 18th and 19th-century Welsh and English slip ware, Swansea and Nantgarw porcelain, Art Pottery and Oriental ceramics. The important collection of early 20th-century British pioneer studio pottery (Martin Brothers, Leach, Hamada, Cardew et al) is on permanent display. All collections are available for study by appointment. 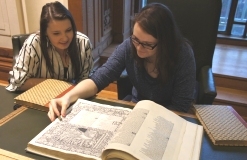 The School of Art offers graduate and postgraduate courses in Fine Art, Art History and Museum and Gallery Studies courses with the art collections at their core.